A cam clamp is real quick and easy to use. 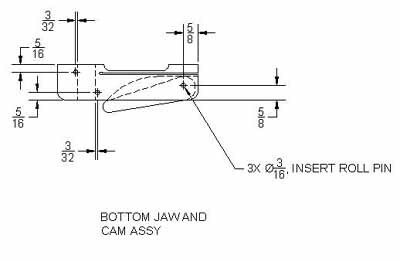 Slide the bottom jaw into contact with your workpiece and flip the cam lever. I can get over 200 lbs of pressure with mine, measured by clamping it on the bathroom scale. 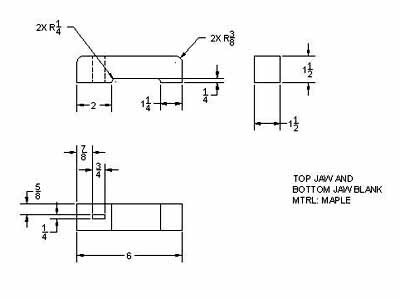 For the jaws and cam, I used maple. The bar is steel, mine is 1/4 by 3/4. I bought it in 20 foot lengths and cut it to size. The most used size is a 12" bar. I also made a few at 18", 24", and 36". The 36" ones are pushing the limit of the bar. The deflection of the bar reduces the clamping force available, but they are still useful. The roll pins are 3/16 by 1-1/2" long. Some hardware stores carry them. Another good source is McMaster-Carr (see Q&A at end). It takes 5 roll pins for each clamp. make sure you cut two for every clamp. Here's the dimensions of mine. Most of the dimensions are far from critical, but these have worked good on mine. 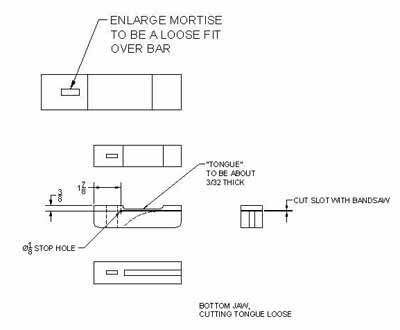 You want the mortise in the top jaws to be a tight fit on the steel bar. cutting the cam slot with a dado blade on the table saw. 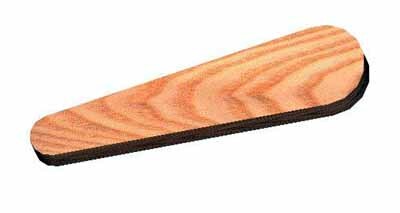 this is a stop dado and you have to back the part away from the blade after cutting the slot. 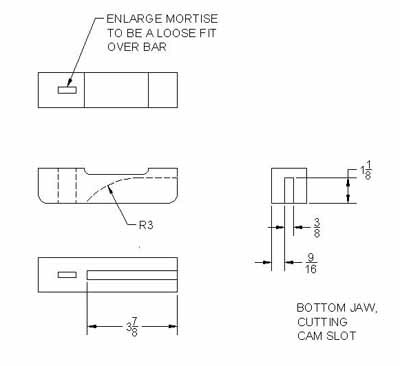 Also, enlarge the bar mortise so the jaw slides freely on the bar. drill the stop hole and cut the tongue free. The tongue thickness is one of the critical parts, it needs to be thin enough to flex and not break when the cam lever is thrown. Cut out the cams next. Make the thickness fit into the cam slot in the bottom jaw where it moves freely. hold the cam in place in the slot in the bottom jaw and drill the pin hole thru both as an assembly. Use a sharp drill bit and proceed carefully. Don't try to drill the holes separately, match drilling ensures minimum play of the cam against the bottom of the tongue. OK, now comes the fussiest part. Drilling the holes for the pins in the bottom jaw that lock onto the bar when the clamp is used. you want the jaw to be perpendicular to the bar when tightened down. using stop blocks on a drill press. insert it in the top jaw and match drill the holes thru the jaw and bar together. Slide the bottom jaw on and go find something to clamp. I left mine unfinished. An oil and / or wax finish would work fine if you want to finish them. Some of the commercial ones have cork applied to the clamping portion of the jaws. I didn't use any, and haven't noticed any problems with marking what I'm clamping against. I've been using mine for over twenty years now. A few times, I've had a cam split when really cranking down on them. Just knock out the pin, cut a new cam and drill it while holding it in position. Insert the pin again, and it's back in business. Go ahead and make a batch, you won't regret it. Q. 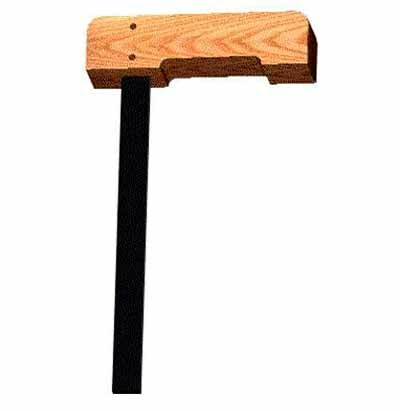 Would it be OK with you if I saved your post information to my web site... http://woodworkstuff.net/ under Jigs & Tools? Go ahead. I'd like to see someone get some use out of it. 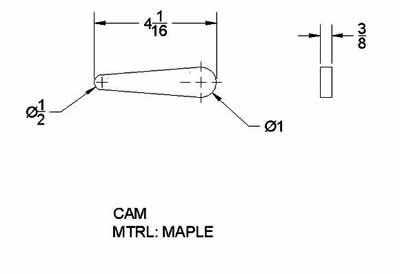 Q. I guess you squeeze the cam inward toward the clamp to spread and clamp? A. You slide the bottom jaw against your workpiece, then pivot the cam lever away from the steel bar. This applies the clamping force. Q. Have you ever broken the wood from too much clamping pressure being applied? A. I have broken a couple over the years, but have succesfully glued the jaws back together or replaced the cam as I mentioned. A. I picked up the steel bar stock art a local steel supplier in Reno. Cold rolled bar would be preferable due to the better finish. The bar I got back when I made mine was hot rolled. Works fine, just isn't as nice a finish on the steel. It came in 20' lengths. It probably would be a good idea to get the steel ahead of time and then make the mortise in the jaws to fit. Mine are 1/4 by 3/4, but anything close to that would work also. This place: http://www.onlinemetals.com has 0.25 x 0.75 flat bar stock. I don't know too much about steel prices, they have cold roll for ~$1.50 a foot and hot roll for <$1 per foot. Now, which one would you suggest? "Standard-Duty Coiled 91598A362 14.60 per Pack of 100"
Some people use solid pins made from heavy welding rod but I find the roll pins work the best for me. 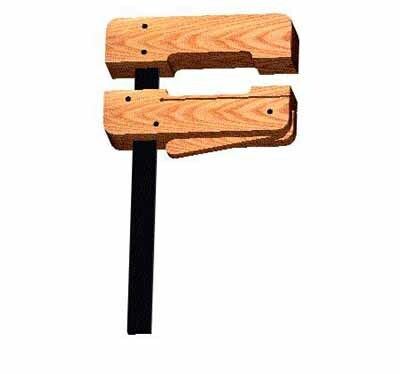 PS: post some pictures of your clamps when you're done with them! Q. When you say 'tightened down' do you mean after the roll pins are in place? or after the clamp is 'tightened down' in clamping pressure? A. 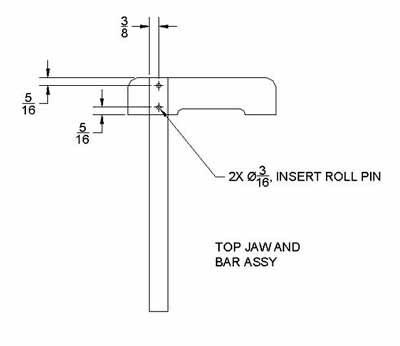 You want the jaw to be perpendicular to the bar when the two roll pins are in contact wih the bar. The jaw is stiff enough, I've never noticed any deflection in it while clamping loads are applied. The clamp will work if the jaw is at something other than 90*, but it looks better if you try to get it close to square. Neat thing about these clamps is that nothing is really that critical. Get anywhere close, and they will work just fine.